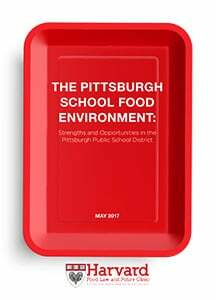 Authored by the Harvard Food Law and Policy Clinic, this report is the result of the Pittsburgh Food Policy Council’s (PFPC) year-long partnership with Harvard and Pittsburgh Public Schools to better understand the challenges faced by schools in our city, to identify best food policies and practices in Pittsburgh and comparable cities, and to highlight recommendations for future work. 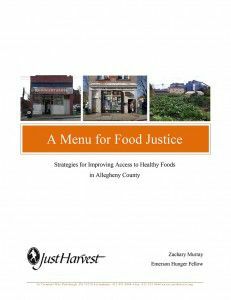 Just Harvest is a member of the PFPC and helped to lead this effort. New data released by the Census Bureau on September 17th show that poverty remains stubbornly high. In Pennsylvania, 13.6 percent of people were poor in 2014 – roughly the same as in 2013 when 13.7 percent were poor. 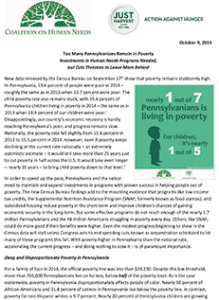 The child poverty rate also remains stuck, with 19.4 percent of Pennsylvania children living in poverty in 2014 – the same as in 2013 when 19.4 percent of our children were poor. Disappointingly, our country’s economic recovery is hardly reaching Pennsylvania’s poor, and progress remains slow. Nationally, the poverty rate fell slightly from 15.8 percent in 2013 to 15.5 percent in 2014. However, even if poverty keeps declining at the current rate nationally – an extremely optimistic estimate – it would still take more than 25 years just to cut poverty in half across the U.S. It would take even longer – nearly 35 years – to bring child poverty down to that level. Recipients of Supplemental Nutrition Assistance Program (SNAP) benefits (“food stamps”) frequently call Just Harvest for assistance with overcoming obstacles in obtaining and maintaining benefits through the Department of Public Welfare (DPW). To deepen our understanding of the frequency of the problems applicants face, food stamp consumers were surveyed about their experiences applying for and receiving those benefits, and test calls were made to the publicly available phone numbers of DPW’s Customer Help Lines and County Assistance Offices located within Allegheny County. 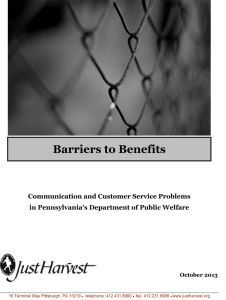 The results of these surveys and test calls illustrate that the department is failing to provide consumers with basic service at a level that is necessary for obtaining and maintaining benefits.